Fairburn, NMRS, 1993, PB, A5, 192pp., 27 figs. This monograph redresses the balance in this much visited but rarely chronicled area where previous studies have almost ignored the major contribution of mining companies other than the London Lead Company. The author divides the area into groups of related veins and gives details of their history, mine adventurers and companies, geology and leases. 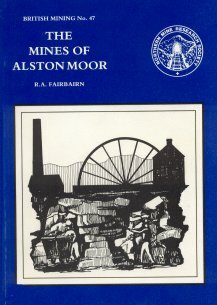 He also looks at smelting, including that which took place at mills remote from Alston Moor. The monograph is copiously illustrated with maps, plans and diagrams.